Founded in 1873, Vanderbilt has a long history of academic excellence, a strong tradition of community, a dedication to research, and a commitment to diversity. * The Engineering Laptop Allowance and Laboratory Fee apply to Engineering students only. First-year Engineering students are required to either purchase a laptop from Vanderbilt or provide their own computer that meets published requirements. Students interested in Pre-architecture, Pre-business, Pre-law, or Pre-medicine may pursue any of Vanderbilt’s 68 majors. All students have access to faculty members designated to provide advice regarding appropriate pre-professional curricula and the postbaccalaureate application process. The University’s progressive financial aid policies assure that it is often cited as one of the country’s best values among national universities. Vanderbilt students engage in interdisciplinary academic pursuits that produce life-changing moments, intricate questions with complex solutions, and remarkable opportunities to make a difference. 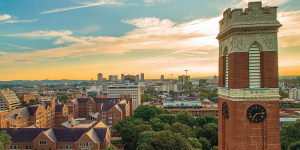 Known for excellent academic programs and an outstanding quality of student life, Vanderbilt is consistently ranked among the top 20 universities in the country by U.S. News & World Report. 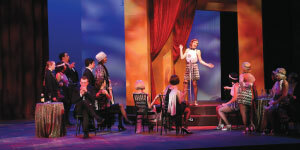 Vanderbilt’s four undergraduate schools (Blair School of Music, College of Arts and Science, Peabody College of Education and Human Development, and School of Engineering) offer a distinct yet close-knit environment, allowing students countless opportunities to pursue their academic passions, including new avenues for growth via undergraduate research. Vanderbilt students take full advantage of student life by immersing themselves in over 430 student organizations, a full range of study abroad programs, Division I athletics, and a variety of internship opportunities. Vanderbilt students and faculty believe that great ideas require more than one school of thought. This interdisciplinary approach is found in the impressive repertoire of interdisciplinary majors, research across disciplines, and the flexibility that students have to explore subject areas across all four undergraduate schools while delving deeply into at least one major area of study. Vanderbilt faculty are committed to the undergraduate experience, and the University’s 7:1 student-faculty ratio gives students easy access to faculty members across academic disciplines. More than 50% of undergraduates participate in research alongside faculty, and a spirit of innovation has helped Vanderbilt earn a #10 ranking for “Most Innovative Universities” for two consecutive years (Reuters, 2017 and 2018). 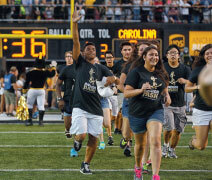 New academic initiatives include an undergraduate Business minor and Immersion Vanderbilt, an initiative that calls for each undergraduate to pursue an intensive learning experience in and beyond the classroom with choices from four pathways: civic and professional, creative expression, international, and research. Vanderbilt’s 230,000-sq. ft. Engineering and Science Building includes classroom and laboratory spaces, a 15,000-sq. ft. clean room, and the University’s epicenter for innovation and entrepreneurship, the Wond’ry. Through collaborative work environments, makerspaces, and curricular programming, the Wond’ry is the place where abstract ideas are transformed into concrete realities that make differences in people’s lives. Vanderbilt makes three important commitments to ensure students from many different economic circumstances can enroll at Vanderbilt: the admission process is need-blind for US citizens and eligible non-citizens (financial circumstances are not considered in the admission decision); aid packages meet 100% of demonstrated financial need for all admitted students; and financial aid packages do not include loans. This initiative does not involve income bands or cutoffs that limit eligibility. Using a holistic application review process and with these financial aid policies, Vanderbilt admits talented students from diverse backgrounds who challenge each other inside and outside the classroom and together form a community of scholars. Life at Vanderbilt includes rigorous academics combined with deep engagement outside the classroom. Vanderbilt is committed to fostering inquiry, dialogue, and a greater appreciation of the racial, cultural, geographic, and political perspectives that make up the Vanderbilt mosaic. Whether organizing a Schools for Schools event with Invisible Children, indulging in an Indian food dinner and dance celebration at the annual Diwali festival, or interning at one of Nashville’s 200+ recording studios, Vanderbilt students are deeply engaged in activities and opportunities on campus and in the surrounding community. With 16 men’s and women’s Division I athletic teams, Vanderbilt is the smallest and only private school in the legendary Southeastern Conference. Your first year at Vanderbilt will be a chance to experience life on The Martha Rivers Ingram Commons. This living/learning community, based on the Oxford-Cambridge model, consists of 10 residence halls, or “houses,” surrounding a main dining and student center. Faculty live on The Ingram Commons, facilitating easy and meaningful interactions between students and professors. Frequent educational and social programming at The Ingram Commons invites students and faculty to explore current events and social issues. Vanderbilt is located in the heart of Nashville, Tennessee, home to a diverse population of 1.8 million and marked by its unique blend of cosmopolitan flair and small-town charm. A thriving center of music, publishing, health care, and technology, Nashville is consistently ranked as one of America’s friendliest cities and was honored by Forbes as #3 for “Best Big Cities for Jobs” (2018). Vanderbilt attracts students from across the country and around the world and sits on a 330-acre campus, designated an arboretum. An active campus life, stellar academics, and urban setting work to maintain a high retention rate, as 97% of first-year students return sophomore year. Vanderbilt offers students unique and meaningful opportunities within the structure of an academically rigorous institution to discover who they are, who they may become, and how they might contribute to their communities in the future.